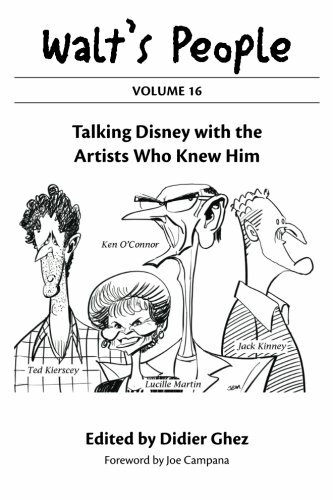 The Walt's People series is an oral history of all things Disney, as told by the artists, animators, designers, engineers, and executives who made it happen, from the 1920s through the present. Walt’s People: Volume 16 features appearances by Louis A. Pesmen, Grim Natwick, Gyo Fujikawa, Hicks Lokey, Jack Bradbury, Jack Kinney, Charles August "Nick" Nichols, Milt Kahl, Marc Davis, Bill Tytla, Ken Annakin, Irwin Kostal, Lucille Martin, Woolie Reitherman, Mel Shaw, Claude Coats, William "Sully" Sullivan, George McGinnis, Jack Buckley, and Ted Kierscey, plus an article by William M. Watkins about roller coaster design and excerpts from the November 1940 issue of The Bulletin (a weekly newsletter once published by the Disney studio) about the making of Fantasia. KEN ANNAKIN shares memories of his time spent with Walt Disney in England working on such films as Robin Hood and The Sword and the Rose. LUCILLE MARTIN provides unique insight about Walt Disney based on her many years of service as his personal secretary. WILLIAM "SULLY" SULLIVAN talks about his four decades with Disney, starting in 1955 on Walt's Jungle Cruise and ending with his retirement as vice-president of Magic Kingdom. GEORGE McGINNIS, an Imagineer and industrial designer, explains the nuts and bolts behind such attractions as Space Mountain, Horizons, and the Mark V monorail (which he designed). The entertaining, informative stories in every volume of Walt's People will please both Disney scholars and eager fans alike.